By Daniel Horowitz--As Diaspora Jews we know that there’s nothing better than celebrating a bar mitzvah in Israel. And, from October 13th to 20th, 2013, United Jewish Appeal of Greater Toronto makes that opportunity a reality aboard its 13th annual Doctors, Dentists and Friends Mission to Israel, and the only bar mitzvah gift required is your participation. The annual mission – chaired by Irv Gottesman and Howard Price – is a great way to experience all that the Jewish state has to offer, thanks to the mission’s special itinerary, complete with an action-packed and exciting line-up designed to bring you a deeper insight into the country. The mission, open to donors who make a minimum household gift of $3,000 to UJA’s Annual Campaign 2014, will provide participants a series of exclusive briefings from a number of Israeli insiders; a visit to pharmaceutical company Teva; an opportunity to visit UJA projects and see your dollars in action, and a very special Shabbat dinner with the incoming Canadian Ambassador to Israel. Mission participants will also enjoy a walking tour of Jerusalem’s Old City, an unforgettable visit to the Western Wall Tunnels, an emotional tour of Yad Vashem, and a tour of the Herzl Museum, including an audio-visual encounter with none other than Theodor Herzl, the visionary of the Jewish state. 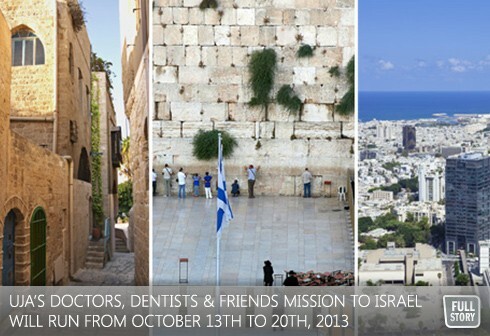 For more information about this the 13th annual UJA Doctors, Dentists and Friends Mission to Israel, please contact Eyal Golan at egolan@ujafed.org or 416.635.2883 EXT. 5136.